Notre Dame senior Katie Dettwiller embraces her teammates after scoring her 1,000th career point in Thursday’s matchup with Eastern. PORTSMOUTH — When Notre Dame’s Baylee Webb found teammate Katie Dettwiller open under the basket with 7:43 left in the first quarter of Wednesday’s 70-33 win over Eastern, it was just like any other bucket for Dettwiller … at first. The 6-foot-4 senior caught the pass, took one dribble and used her right hand to hit nothing but net, giving the Titans a 2-0 lead. But when the buzzer sounded and her teammates started clapping, there was a look of confusion on her face. Dettwiller, unknowingly, had scored her 1,000th career point, joining an exclusive club of players that have graduated as a Titan. While 1,000 has never been a particular goal of hers to cross off, Dettwiller says the honor is something she’ll be proud of for years to come. It’s safe to say Dettwiller is one of those legends, and that was before she scored her 1,000th. Over the past three seasons, with Dettwiller leading the charge, Notre Dame has an overall record of 67-4. During that time, Dettwiller has averaged 13.2 points and 9.4 rebounds. This year alone, she’s averaging team-highs of 17.1 points, 9.1 rebounds and 4.2 blocks. Thankfully for Notre Dame, Dettwiller’s passion for basketball started early. Since that time, she’s not only used that passion to drive her, but she’s let it grow wings. Sure, she plays for love of the game. But she also plays for her teammates, coaches and family. Dettwiller says none of her accomplishments — including 1,000 — would be possible without the support system she has in place. Dettwiller has signed to play with Division I Saint Francis University next season. But she’ll first focus on helping Notre Dame extend its season as long as possible. 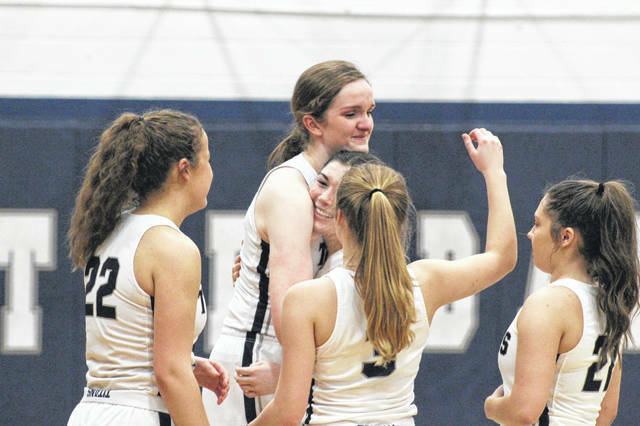 The Titans are currently 19-1 — the lone loss coming to Division III state-ranked Waynesville — and have earned a top seed in the Division IV Southeast District sectional tournament draw. Following games with East and Belpre to close out the regular season, the Titans will match up with either Glenwood or Eastern in a sectional final Feb. 14 at Northwest, tipping off their postseason. Last winter, Notre Dame ended its season with a 49-30 loss to Waterford in a regional semifinal. This year, the Titans are hoping to take it one step further while simply playing their style of basketball. “I hope that, as a team, we can go as far as possible in the tournament and end our season on a high note,” Dettwiller said. Short and simple and, with Dettwiller leading the charge, the sky is certainly the limit.